In the beginning of 1869 Mussorgsky had accepted the post of Assistant Chief in the Forestry Department of the Ministry of State Property, but he still managed to complete the first version of his monumental opera Boris Godunov by the end of the year. He wrote most of the songs (both words and music) that form The Nursery in the autumn of the following year; to these he added an earlier song S nyaney (‘With Nanny’), written in 1868, when the set was published by Bessel in June 1872. Two more songs—Kot Matros (‘Sailor the Cat’) and Poyekhal na palochke (‘On the Hobby-Horse’)—were completed later in 1872 and were published separately. The Nursery became one of Mussorgsky’s most popular works during his lifetime. It is even reported that after the then-famous soprano Aleksandra Molas performed the cycle at one of her concerts, dozens of copies of the pieces were sold at Bessel’s music shop. Numerous sources refer to Mussorgsky’s liking for and affinity with children. Varvara Komarova-Stasova (niece of the influential critic Vladimir Stasov) remembers meeting the composer when she was a child of seven: she later recalled that ‘since he did not strike a pose with us and did not speak to us in that artificial language ordinarily used by adults with children … we began to consider him one of us. Kot Matros was one of a few songs he wrote that represent stories of our childhood.’ So Mussorgsky had brought the historical and theatrical realism (for which he became known in his operas) into everyday life by depicting, in music and words, scenes that he may have actually witnessed. 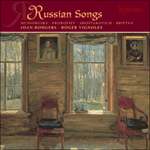 The style of the songs is varied but typical of that of Mussorgsky’s maturity; he derived his language not only from folk music and the russkaya pesnya, but also from the romans, and from the Romantic masters of western European music such as Liszt. In his quest to discover the musical equivalent for the patterns, inflections and cadences of spoken Russian, Mussorgsky created eternally fresh yet haunting tableaux of domestic life. Au début des années 1869, ayant accepté le poste d’assistant en chef du service des forêts du Ministère de la propriété d’État, Moussorgski n’en parvint pas moins à terminer la première version de son opéra monumental, Boris Godunov, avant la fin de l’année. Il écrivit la plupart des Enfantines (paroles et musique) à l’automne de l’année suivante; il leur ajouta même une mélodie plus ancienne, S nyaney, écrite en 1868, au moment de la publication de l’ensemble par Bessel en juin 1872. Deux chansons supplémentaires, Kot Matros («Le chat Matelot») et Poyekhal na palochke («Sur le dada») furent achevées plus tard en 1872 et furent publiées séparément. Les Enfantines devinrent l’une des œuvres les plus populaires du vivant de Moussorgski. On raconte même qu’après un récital au cours duquel la très célèbre soprano de l’époque, Alexandra Molas, chanta le cycle tout entier, la maison Bessel vendit des dizaines de copies de l’œuvre. De nombreuses sources rapportent combien Moussorgski se sentait proche des enfants. Varvara Komarova-Stasova (nièce de l’éminent critique Vladimir Stasov) se rappelle sa rencontre avec le compositeur alors qu’elle avait sept ans: loin d’adopter ce langage emprunté avec lequel les adultes parlent souvent aux enfants, il fut très naturel avec nous. Si naturel, que nous commençâmes à le compter parmi les nôtres. Kot Matros était l’une des rares chansons qu’il écrivit lui-même, et qui dépeignent des histoires de notre enfance ». On le voit, Moussorgski importa le réalisme historique et dramatique (si caractéristique de ses opéras) dans la vie de tous les jours, en décrivant, en paroles et en musique, des scènes dont il était le témoin. Le style des mélodies varie, mais il est typique de la période mûre du compositeur; il tirait son langage non seulement de la musique populaire de l’époque et de la russkaya pesnya, mais aussi des romans, et de l’inspiration des grands maîtres romantiques de la musique européenne, tels que Liszt. Dans sa quête de la découverte de l’équivalent musical des motifs, des inflexions et des cadences du russe parlé, Moussorgski créa des tableaux frais et à la fois obsédants de la vie quotidienne. Obwohl Mussorgskij zu Beginn des Jahres 1869 die Stelle des stellvertretenden Leiters der Forstwirtschaftabteilung des Ministeriums für Staatseigentum angenommen hatte, gelang es ihm trotzdem, gegen Ende des Jahres die erste Fassung seiner monumentalen Oper Boris Godunow abzuschließen. Im Herbst des darauf folgenden Jahres schrieb er die meisten Lieder, aus denen sich die Kinderstube zusammensetzt. Als Die Kinderstube im Juni 1872 bei Bessel im Druck erschien, hatte der Komponist noch ein älteres, 1868 komponiertes Lied, S njanej („Mit der Njanja“) hinzugefügt. Zwei weitere Lieder—Kot Matros („Der Kater Matrose“) und Pojekal na palotschke („Steckenpferdreiter“) – wurden später im Jahr 1872 beendet und separat veröffentlicht. Die Kinderstube wurde zu Lebzeiten des Komponisten Mussorgskijs bekanntestes Werk. Man erzählt sich sogar, dass die damals berühmte Sopranistin Aleksandra Molas die Sammlung in einem ihrer Konzerte aufführte. Duzende Exemplare des Stücks wurden danach im Laden von Bessel verkauft. Zahlreiche Berichte dokumentieren Mussorgskijs Interesse an und Zuneigung zu Kindern. Warwara Komarowa-Stassowa (die Nichte des einflussreichen Kritikers Wladimir Stassow) erinnert sich an ein Treffen mit dem Komponisten, als sie sieben Jahre alt war. Sie erzählte über Mussorgskij später das Folgende: „ … weil er sich nicht wie ein Erwachsener aufführte und zu uns nicht in dieser künstlichen Sprache sprach, die von Erwachsenen gegenüber Kindern gern angewandt wird … , begannen wir ihn als einen der Unseren zu betrachten. Kot Matros war eines seiner diversen Lieder, die Geschichten von unserer Kindheit erzählten“. So brachte Mussorgskij den historischen und szenischen Realismus (für den er in seinen Opern berühmt wurde) in das alltägliche Leben, indem er in Wort und Musik Situationen abbildete, die er vielleicht selbst erlebt hatte. Stilistisch unterscheiden sich die einzelnen Lieder voneinander, aber alle sind typisch für den reifen Mussorgskij. Für seine Musiksprache erhielt er nicht nur Anregungen von der Volksmusik und dem russkaja pesnja, sondern auch von der romans und den europäischen Meistern des 19. Jahrhunderts wie Liszt. Auf seiner Suche nach musikalischen Entsprechungen für die Phrasierung, Sprachmelodie und Kadenzierung des gesprochenen Russischs schuf Mussorgskij ein anhaltend frisches wiewohl auch beklemmendes Tableau des häuslichen Alltags. I kak deti te krichali, plakali. Ved´ za to on s´´yel ikh, nyanyushka? Kak chikhnyot styokla v drebezgi! Tï pro buku-to uzh ne rasskazïvay! Bog s nim, s bukoy! Rasskazhi mne, nyanya, tu, smeshnuyu-to! About the wolf, that dreadful, wicked wolf. So he ate those children, Nanny dear? Who lived beside the sea in a lovely palace. Wherever he stumbled, up sprang a mushroom! That when she sneezed all the window panes cracked! I don’t want to hear about the wolf again. Let me hear the other, yes! That funny tale! Akh tï! vse petli spustil! Ya chulochek ne trogal, nyanyushka! A u nyani chepchik na boku. Dear me! All my stitches are dropped! My knitting with ink is bespattered! Never once did I touch your knitting! And needles all came out because of that. Mishenka was as good as gold. Nanny’s cap is never straight. And I am sent in the corner here. Tekh, shto mne mama, sama mama nashepala. I pryamo na menya vsyo smotrit! I naletel, v visochek menya udaril! I ne gudit uzh, tol´ko krylyshki drozhat. Shtozh, on umer, il´ pritvorilsya? Skazhi mne, nyanya, s zhukom-to stalos´? Menya udaril, a sam svalilsya! Shtozh eto s nim stalos´, s zhukom-to! Think how awful, let me tell you! With the pieces Mummy dear herself has cut me. His wicked eyes fixed upon me! And flew towards me quickly. And with a bound he hit me upon my temple. Sat still and hardly dared to breathe! And fancy, what do you think Nanny? Was he dead then, or only foxing? O tell me, Nanny! What’s your opinion? A blow he gave me, perhaps his last one! What was he up to, that beetle? Tyapa, bay, bay, tyapa, spi. Den´ I noch´ poyut ptichki zolotïye! Go to bye-bye, Dolly, go to sleep! Close your little eyes to rest! And take you away to the dark woods! Night and day sings golden birds! Come now, go to sleep, to sleep, Dolly! Gospodi pomiluy bratsa Vasen´ku i bratsa. Babushke dobren´koy, babushke staren´koy; Gospodi! I vsekh ikh, gospodi, spasi i pomiluy. Nyanya, a nyanya! Kak dal´she, nyanya? Gospodi pomiluy I menya greshnuyu! And keep them safe, God! Grandma is so very good and so old; dear God! Dear God, please watch over all of them. Nursey, do tell me, what comes next? ‘O really, what a dreadful memory! How many times have I taught you? Gentle God, watch over little me! Gop gop, ta ta ta. Oy, bol´no! Oy, nogu! Oy, bol´no! Oy, nogu! Milïy moy, moy mal´chik, chto za gore! Nu, polno plakat´; proydyot, moy drug. Postoy-ko. Vstan´ na noshki pryamo: vot tak, ditya. Akh, chto za ptichka divnaya! Vidish´? Nu, chto? Proshlo? Proshlo! Trot, trot, trot, get along! Gee up, gee up! On we go! Oh, it’s hurting! Oh, my foot! My dear boy, what’s the matter? Don’t cry; it will pass, my friend. Come on, stand up; just like that my child. What a delighful little bird! See it? Well then? Has it gone? It’s gone! Ay, ay, ay, ay, mama, milaya mama! Snigir´ drozhit, zabilsya v ugol, pishchit. E, brat, do ptichek tï lakom. Net. Postoy, popalsya, vish´tï, kot! Pal´tsam tak bol´no, mama, mama! Net, kakov kot-to, mama … a? Hey, mummy listen, kind mummy! Maybe I left it by the window? He crept up and scratched at the cage! The little bird trembled, far in the corner, and chirped. So, puss, you’d kill the little bird, would you? All right, I’ll get you, just you wait! I gave him one like this! Mummy, what a hard cage we’ve got! My fingers really hurt now, mummy! And haven’t we got a nasty cat, mummy?